Classical music fans know that 2010 is a Chopin Year and a Schumann Year – both great composers were born in 1810. But this year — specifically, this week — is also a celebration of the bicentennial of free and independent Mexico. And although Mexico is far better known for its folk music, classical music has loomed large in its history. Indeed, there were even Mexican and Spanish composers of the Baroque era. Now Sony Classical has marked the occasion with a specially priced ($24) 2-CD set called “My Mexican Soul” (Mi Alma Mexicana). 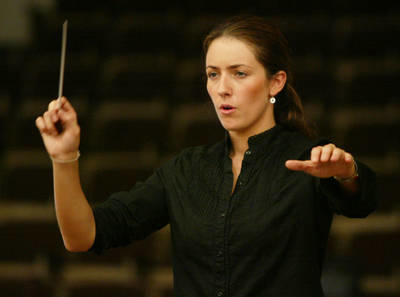 It features classical music by Mexican composers performed by the Philharmonic Orchestra of the Americas under the young Mexican conductor Alondra de la Parra (below), who founded the orchestra she is director of and who is making her debut on Sony with this album. She has garnered critical praise, including form the New York Times. A woman Mexican conductor? Maybe northern attitudes about Latin machismo need some revising. The wide variety of music runs from 1884 to 2006, with an emphasis on the 20th century. A couple of names – Manuel Ponce and Carlos Chavez – are familiar to North American and even worldwide listeners. But most composers’ names – Moncayo, Campa, Huizar, Roasas, Ibarra, Toussaint, Lavista, Chapela and others – are not are not well-known this side of The Border or elsewhere. Maybe they aren’t even that well-known in Mexico, for all the Ear knows. Included are two world premieres and wide variety of genres including a piano concerto, work for violin and orchestra, and a work for guitar and orchestra. In my sampling of the CDs, I have founded the music extremely listenable and accessible, often sounding like Aaron Copland’s music and often incorporating elements of jazz or popular music, much as Ravel did. The moods range from the serious and dark to the pensive and lyrical, to the festive and celebratory. In short, this is an enjoyable recording and stands out as a unique in a field where so much repertoire is constantly repeated and re-recorded. Some symphony orchestras would be wise to look to these works to include in their subscription series. It’s good music and might even draw some new Hispanic listeners to the concert hall. Sony has done a real service. This is an impressive and educational recording, one that is long overdue as we work to better relations with Mexico, which deserves to be known for more than tourist resorts, drug violence and tales of Spanish conquest. We know more about Mexican painters – Diego Rivera, Frieda Kahlo, Jose Luis Orozco – than we do about its music. But as this set makes clear, there is no longer an excuse for our ignorance. So, you don’t have to give up mariachi bands. But why not celebrate Mexico with classical music? If you do, “My Mexican Soul” is the place to start.